The Blob – For Kids! If you hid it under your shoes and coat, the book couldn’t get you. If taking the Crestwood House children’s novelization of The Blob out of book bag and throwing it into the woods behind my house would’ve stripped the horrible images from my brain, I would’ve done so without hesitation. Before my parents got sick of the nightmares, I used to read everything scary the Denver Public Library had on its shelves. Crestwood House had other monster books, and they had given me their own sleepless nights (I’m looking at you here, Dracula book). Still, nothing unsettled me like reading The Blob unsettled me. The actual movie isn’t this scary. To be fair, I saw it when I was much older. Still, the blob I imagined was like liquid death. It sloshed across floors and drank people’s innards like a towel on a fruit juice spill. Sure, the book and movie offer some crap about the blob being vulnerable to cold. As a kid, I knew better. The “cold can save us” bit was just so the less gullible kids could sleep at night. I wasn’t gullible. I knew that real life blobs probably bubbled about just fine in hot and cold temperatures. This is how I knew we were all doomed when the real blobs came, and this is why I stayed up watching the floor for blob tracks. This may even be the book that caused my parents to call the school and ask them to keep me away from scary books at the town library. The always-excellent Rue Morgue Magazine has written about Crestwood House. For more info on the other titles in the series, check out this article. 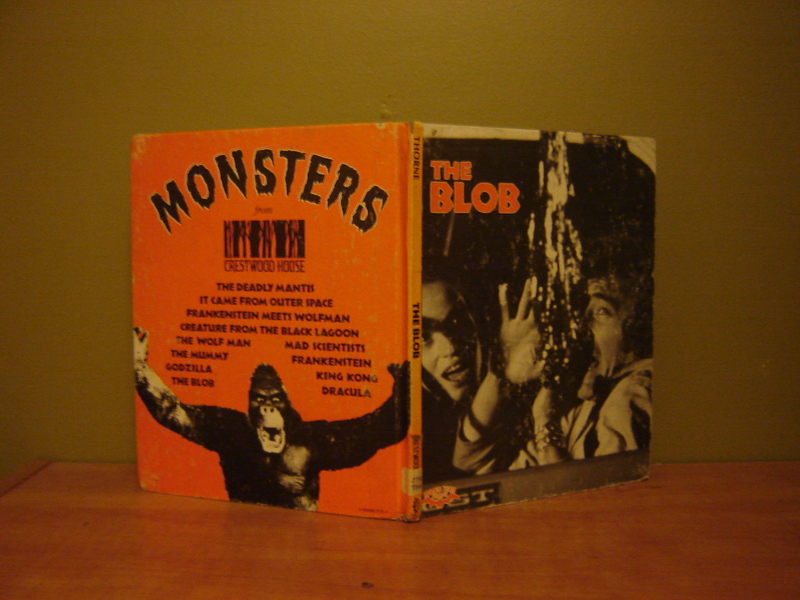 Years ago, my childhood library had a massive moving sale and I bought The Blob as a trophy. Some people have grizzly bear heads on their walls. I have my blob book. And I am a survivor. Keep watching for blob tracks! If you need to have a song stuck in your head for the next twelve days, please enjoy this link to the theme song from The Blob.